Between the periods 1990 to 2000, there were diverse forms of political killings and related crimes in Cameroon, ranging from state sponsored actions to local political conflicts and rivalries. In May 1990, 6 people were killed and hundreds more injured in Bamenda, following efforts by the state to suppress a political rally the newly founded SDF Party. In 1992, at least 100 families were displaced and property worth millions of CFA looted and destroyed during political efforts to check electoral fraud. In 1992, Tita Fomukong, a Bamenda based politician was lynched. 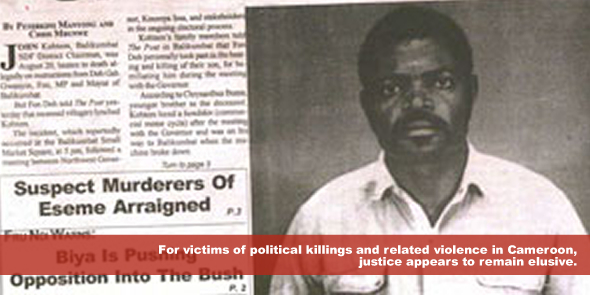 In 2000, Eseme Martin, a Kumba based lawyer and politician was assassinated. In 2004, John Kohtem, a Balikumbat based politician was assassinated. In 2006, Gregoire Diboule, a Yaoundé based politician was also assassinated. A review of the above cases confirms that prosecutions were never initiated for the 6 killings in 1990; the massive destruction of property, and the killing of Fomukong in 1992. Therefore, 50% of the cases were never prosecuted. Prosecutions were ordered for the killings of Eseme, Kohtem, and Diboule, resulting to a 50% prosecution rate. However, in the Diboule case, the preliminary inquiries that were begun in 2006 remain inconclusive to date. Improved relations between the CPDM and SDF political parties have stoked suspicion that justice in this case has been sacrificed on the altar of political expediency. Although the Eseme and Kohtem killings fell to be determined by the ordinary courts, innovative measures were introduced to alter the structural compositions of the courts. Judges were co-opted from other jurisdictions apparently with approval from the Minister of Justice. The specially constituted courts lost the competence to determine the cases. The convictions recorded in these cases were later overturned on appeal on the common ground that the trial courts were irregularly constituted, resulting to a 0% conviction rate. While special courts are common features in post-conflict societies, they are however, hybrid mechanisms that lie somewhat at the interface of wide spread heinous international crimes and domestic jurisdictions and driven by the logic to maximize justice outcomes. Jurisdictional regularity is the bedrock of a legitimate trial process. Judges with ordinary territorial jurisdiction are exclusively competent to determine cases within their territorial precincts. In deserving cases, judges from different jurisdictions in Cameroon may preside over cases outside their territorial jurisdictions, but such must be grounded on petitions of bias as provided for by sections 591-604 of the Cameroon Criminal Procedure Code. The Eseme and Kohtem cases were isolated cases of suspected political assassinations that fell to be determined by the ordinary courts under the simple rubric of murder. There was no wide spread action and no recusal petitions against the regular courts. The special mechanisms were legally unjustified, but given the status of the suspects as key politicians, it is argued that these measures were politically motivated with a view to adversely affect the justice outcomes in these cases. Predominance of regular law and equality of all before the ordinary courts are the benchmarks of rule of law. Crimes must be capable of objective determination and the institutional design of a judiciary must operate to ensure a fair, rational and predictable application of laws. These special measures therefore reflected the differential application of law, and create a perception of impunity for political killings and related crimes in Cameroon, but also that regularly constituted courts cannot deal with this category of cases. This sense of impunity undermines the rule of law and demonstrates that political killings present a peculiar challenge to the administration of criminal justice in Cameroon. While justice is a fundamental human value and a central component of the criminal justice system in Cameroon, for victims of political killings and related violence, justice appears to remain elusive. Emmanuel A. Nkea is a Barrister of the Cameroon Bar, a Judge Emeritus of the High Courts and Gambia Court of Appeal and Partner at SCP Security Law Firm, Tiko Cameroon with a passion for the rule of law.